Go to a mirror right now, and take a look at your collarbones. (Take off any extra layers of clothing first, of course.) Your collarbones "should" be parallel to the floor, and ideally, would be symmetrical. However, most aren't. Take a good look-do they form more of a V shape? Is one noticeably higher than the other? How does that affect the distance between your neck and your shoulders? Is one of your shoulders more rolled forward than the other? (Fact: My left collarbone is noticeably higher than my right. My left shoulder is also noticeably tighter than my right, and no, I'm not sharing a picture of my clavicles). As I mentioned in last week's shoulder 101 posting, the collarbone, or clavicle, is one of the three bones of the shoulder joint. The asymmetry in your clavicles invariably is a reflection upon what's going on in your soft tissues in your shoulder and chest, whether they be work-related, injury-related, or the result of postural patterning. I mentioned the key players in the rotator cuff last week, but the muscles of the anterior body also affect shoulder mobility. 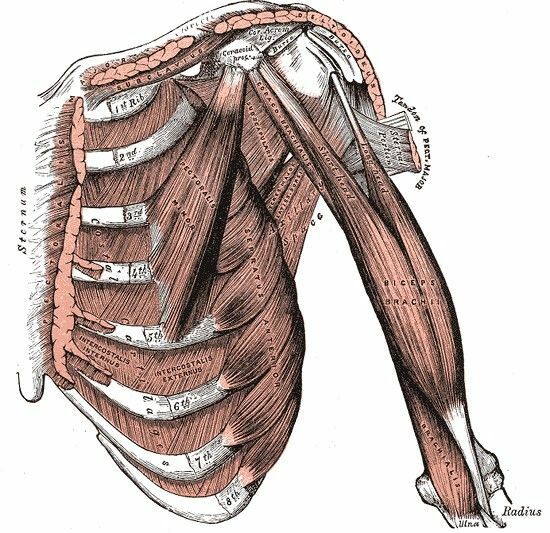 This older drawing from "Gray's Anatomy" shows how the muscles of the chest can govern the position of the clavicle and the shoulder. Pectoralis Major: This large chest muscle helps to internally rotate the shoulder as well as flex (arms overhead) and adduct (bring the shoulder and arm back to the body). If you look at bodybuilders (not that I do that often), they have huge pecs, and consequently have limited shoulder mobility and range of motion. They often have a rounded upper back and rounded shoulders as well. Pecoralis Minor: This muscle attaches the ribs to the coracoid process, which is a small hook-like portion of the scapula. Basically, it connects your ribs to your shoulder. It assists in depressing the scapula (lowering the shoulder away from your ears), and abducting the shoulder (lifting the arm away from the body). As you can imagine, if this muscle is extremely tight, your shoulders will roll forward and one or both clavicles could form the v shape. Subclavius: This small muscles runs underneath the clavicle, and assists in depressing the clavicle, lifting the first rib in respiration, and stabilizes the shoulders. What this means is that the rotator cuff and trapezius are not the only big players in your shoulder mobility and posture, and that stretches and poses that address the front of the chest as well as the posterior shoulder tissues are essential to a healthy and happy shoulder.